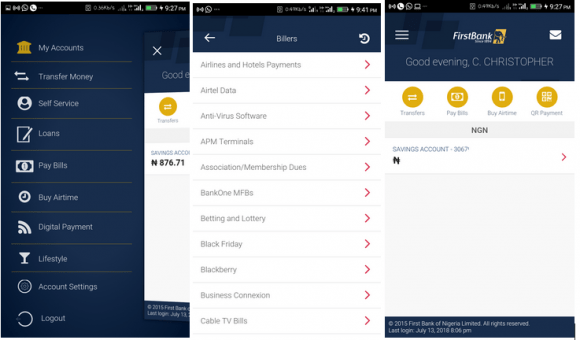 Here is an in-depth review of First Bank Mobile App along with its mobile banking functions. It is a straightforward FirstBank Mobile App review and guide on how to use First Bank mobile banking app without missing a step. Although we’ve previously written about how to use USSD codes to do various banking transactions (such as: airtime recharge, money transfer, check balance, bill payment, and etc). We’d like to talk about First Bank mobile app today. First Bank of Nigeria is one of the most popular and highly patronized banks in Nigeria. They have been in existence for more than a century now and does have a lot of persons that’s banking with them. You can download First bank mobile app easily popular mobile app store irrespective of your smartphone operating system (Android, iOS, BlackBerry, and etc). If you are using a feature phone (Java, Nokia s40 series, Symbian, etc), you’d not be able to use First bank mobile app for smartphones. Instead, you can do mobile banking with *894# USSD code: This method is even faster and reliable; this is because it doesn’t limit you to a high-end device and works without internet access. Now, for smartphone users, simply visit your mobile app store and search for FirstMobile or download the app directly from any of these First bank mobile app download links. Statement of account and etc. After downloading First bank mobile app from your app store, the next to do is – to set it up correctly. You must have a valid FirstBank ATM card before you can activate and use this mobile banking app. Open FirstMobile app from your phone’s icons. Click on “Register” for new users. Old users are to click on “Activate” button instead. Follow the on-screen prompts and instructions to activate the app. Type in your card details when you’ll be asked to enter your ATM card number and PIN. Launch the FirstMobile app from your phone’s icons. Click on “Buy Airtime” button. Select your mobile telecommunication network provider. Enter the mobile number where you want the airtime to be loaded into: Ie – it could be your mobile number or any other person’s own. Enter the airtime amount (from N50 – N10, 000) and click on continue. Select the bank account from which the money would be deducted from (for users with multiple bank accounts). Enter your PIN (created when registering with the app) and tap on the “Pay” Button. There are lots of supported merchants who you can pay for their services through First bank Mobile app. Some popular providers includes; DSTV and GOtv satellite subscription, Airlines and Hotels payment, APM Terminals, EDUPAY, Phone bills, and lots more. Enter your PIN and click on pay. The introduction of mobile banking into our cyberspace has increased productivity in many ways than one. Now, you don’t have to while away your precious time inside the banking hall just to send money to a business partner, friends or family. With First bank mobile app, you just tap your phone a few times and the transaction is all done and dusted! Select the account from where the transaction would be carried out: This option is very useful for customers with more than one account activated on the app. Choose the destination bank/financial institution where you are sending the funds to. Fill in the details (Account number and name) of the beneficiary. Once you enter the account number, the app will automatically look out for the owner of the account and display the name (if valid). Enter the amount you are sending and also, add a short note or description (optional but important when you’re paying for something). You’ll be shown an overview of the transaction you’re about to carry out for a proper review. Enter your PIN once you’ve confirmed the information is correct and then tap on the “Transfer” button to complete the transaction. These are the core banking operations we do most often. 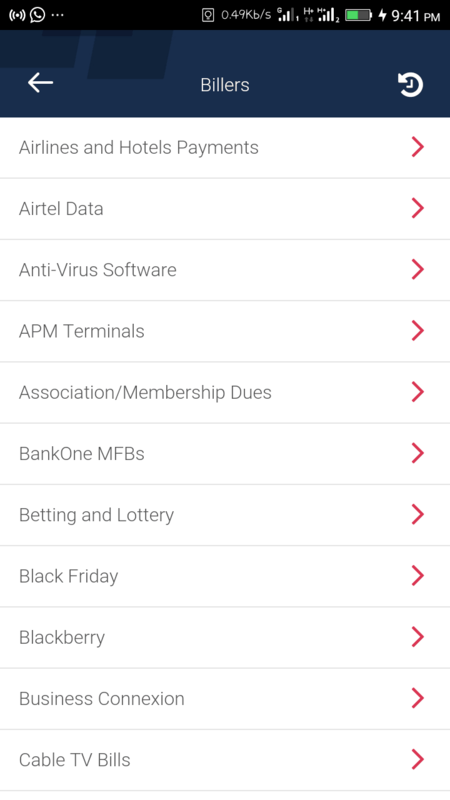 There are some other stuffs you can easily do with First bank mobile app such as: Flight booking, self-service options (blocking a card, request for a new card, mini account statement report, and etc.). You can even do QR based payments easily with FirstMobile app. 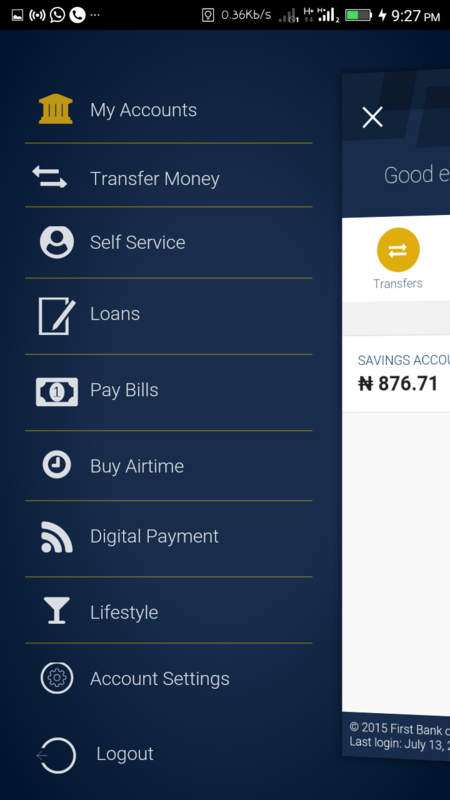 First Bank mobile app has really simplified banking services for all First Bank users: It lets you do almost all core banking transactions from your smartphone. There are lots of options for different type of transactions and you also get to see the summary/list of all your recent transactions within a selected time frame. PS: You can tell us about any issue you’re having with downloading First bank mobile app. We’ll guide you on the best ways to resolve such challenges. That should resolve in a while, else you’d need call First Bank customer support line.